Tried and True Chocolate Chip Cookies are exactly what the name says. Tried. True. Chocolate Chip cookies that turn out a little crispy, gooey in the middle, perfect every time. The last recipe for classic chocolate chip cookies you will ever need! Is there anything better after a long day at school than a melt-in-your-mouth Tried and True Chocolate Chip Cookie? I’ve made lots of chocolate chip cookies in my life, and I’m here to tell you this is the one. That recipe you’ll be known for. The chocolate chip cookie recipe you’ll make over and over and over again. If you’ve ever made chocolate chip cookies, you’ve probably had a baking failure. Am I right? Today, we are going to solve that problem. Once and for all. NO MORE CHOCOLATE CHIP PANCAKE COOKIES. Ever again. In 2010, after months of testing methods and ingredient combinations for baking chocolate chip cookies, I came up with a recipe that works. Every. Single. Time. Since then, I’ve continued to update, simplify and improve this recipe for Tried and True Chocolate Chip Cookies. For the original recipe, with step by step photos, check out this post. This recipe is a one bowl, 20 minute (start to finish) success. I’ve made thousands of Tried and True Chocolate Chip Cookies. Everyone from young neighbor kids to folks in nursing homes love them. I’m guessing they will become your new family favorite too! Preheat oven to 375° F. If using convection, preheat to 375 as well. For regular oven, place rack in middle of oven. When using a convection oven, you should be able to bake on all racks at one time. Cut butter into pieces ( about 2 tablespoons each) and place in mixing bowl. I use a Kitchen Aid and power it on 2 (low). After a few seconds, add granulated sugar, brown sugar and vanilla extract. Mix on low speed until creamy (this takes just a few seconds). The butter and the sugars should be mixed enough so no chunks of butter are visible. Add eggs, beating just until incorporated and smooth. Never turn the beaters on high. Using a spatula, scrape down the sides of the bowl and bottom of the bowl to insure all ingredients are incorporated. Dump 2 cups of the flour, soda, salt and chocolate chips all together into bowl with butter mixture. Add the remaining 3/4 cup of flour to the top of this mixture. Slowly mix the dry ingredients and the chocolate chips together. I have had great success with simply PULSING the mixer at this point. Do not over mix. Turn the dough with a rubber spatula so the bottom of the dough is mixed into the top of the dough. This will insure the flour is mixed in properly and the chips are distributed evenly. If the dough is sticky, add an additional 2-3 tablespoons of flour to the dough. Remove the bowl from the stand if using a stand mixer, and fold in the flour. This is only necessary if the dough is sticky. Using a cookie scoop, drop onto un-greasedbaking sheets, or baking sheets lined with parchment paper. Place 6 scoops of dough on each baking sheet. Flatten slightly with the palm of your hand. If using convection, bake for 7-10 minutes until golden brown. If using regular (non convection) oven, bake at 375 for 10-12 minutes. Cookies should be slightly golden and the cookie should not be wet on top. -Only use butter. No margarine. Unsalted butter is best. The butter should be more firm than room temperature butter. I take it straight out of the fridge, and microwave it for about 18-20 seconds. My microwave is not super powerful. Your microwave will probably differ from mine. Start with about 12 seconds and remove butter. You want the butter to be barely soft, as in, when you push your finger into the butter it should barely leave an indentation, but it should leave an indentation. If you have microwaved the butter and it is too soft, you can make the cooked dough and either add an additional 2 tablespoons of flour to the dough or refrigerate the dough for about 30-45 minutes before baking. -*Our altitude is about 4,400 ft. I use about2 3/4 cups flour total. The original Toll House recipe calls for 2 1/4 cups. -Don't over beat the butter-sugar mixture, or the batter will become too soft, and your cookies will not be beautiful and puffy. They will resemble pancakes. -Use eggs that are straight out of the refrigerator. Most bake recipes call for room temperature eggs. This recipe is designed for cold eggs. If you use room temperature eggs, the cookies are more likely to spread while baking. -There is usually a notable difference between using a convection and a standard oven. If you bake at the same temperature, for the same amount of time, the convection cookie will be done, with a beautiful, golden, slightly crispy outer layer. Still soft on the inside. And it will be taller than the cookie baked in a standard oven. Not everyone has a convection oven- if you don't, you can still bake a great cookie using a standard oven! -I think two of the biggest mistakes made while baking cookies are: 1-Over mixing. This will cause the batter have too much air incorporated, producing a fluffy, instead of a chewy cookie. As stated in the updated recipe, I usually just pulse the mixer after the dry ingredients are added, which creates more of a folding action instead of mixing. 2-Over baking. Under baking is good! Not under baked to the point the cookie is wet and doughy, but just until the top sets, and the dough looks like it has a bit of a crust. -Chocolate chips - For semi sweet, I use Nestle Semi Sweet chips. I have also had good luck with Trader Joe's brand semi sweet chips or Hershey's Chocolate Chips. Nestle is my favorite for day in day out semi sweet chips. For Milk Chocolate, we prefer Guittard . The chips are called Maxi Chips and are sold in a silver colored bag. -If the cookie spreads too much, or the edges are not even, I take a small spatula and push the edges inward to create a cookie that is round. This has to be done immediately after removing from the oven, or remove the pans half way through baking and push the sides in to form a circle. Place pan back in oven and finish baking. -High Altitude info: Not recommended-directions on Nestle Chocolate Chip package for high altitude- I have tried this variation, and DO NOT like the result. The cookies aren't quite sweet enough, and have a crispy more cake like texture. Here are the directions on the package: (again I DO NOT recommend using this method, but have printed it here as an FYI) Increase flour to 2 1/2 cups. Add 2 teaspoons water with flour and reduce both granulated sugar and brown sugar to 2/3 cup each. Bake drop cookies for 8 to 10 minutes and pan cookie for 17 to 19 minutes. -Last tip. Mound the cookie into a ball. I make them about the size of a golf ball. I use a cookie scoop, because it's easier for me. For years, I just used a spoon, and then shaped them by hand. Make sure to flatten the cookie just a little bit before baking. To yield 18 cookies use a 2 1/4 inch scoop. If you want to watch a step by step cook along with me video, I have a tutorial here! Thank you SO much for the very detailed instructions. I have always wondered why my cookies didn't turn out like I wanted them to. I always beat the butter and eggs until they were super fluffy. These sound fabulous! I think chocolate chip cookies are in my afternoon plans! You're welcome Carolyn! All of the little things make a difference when baking in our altitude. Happy baking! I would use two unless the eggs seem really small then I'd probably use two plus a yolk. …and I used two plus I beat one extra in a cup, and added half of the beaten egg. You see, I was too impatient to wait for a response. :/ The dough tastes good, so if the cookies don't turn out, I can just eat the dough. Win/Win. i live in houston, texas, so basically sea level! could you suggest a flour amount to use? also, where do you get such big cookie scoops? love it! I would start with about 2 1/4. My guess is you will need a total of about 2 1/2 . If the dough still seems sticky, add a tablespoon at a time, just until the dough is not sticky. Let us know how it bakes up at Sea Level! thanks. I'm a baker. I can bake anything! But that basic freakin' chocolate chip cookie recipe on the back of chocolate chip bags has messed with me for years! I always ruin them. I've never been able to understand it. They always tasted good, but they looked like crap…and we eat with our eyes, right? But then yesterday, I watched you on Studio 5 and I knew you had come to rescue me! And listen–I just made this recipe and they are BEAUTIFUL in every way…taste, texture, & appearance. Your tips are magical. I will no longer be afraid of that recipe on the back of the bag! And my husband will no longer be able to mock my sad little cookies. Thanks! So good to hear you had success! It makes me smile when I hear stories like yours! Thanks for sharing and happy baking! recipe = Mango Pasta Salad! Thanks for the tips!! Do you recommend "pure conv" or "conv bake" when using all 3 racks for cookies? BTW – you were darling on Studio 5!! I think that you are the most wonderful woman on the planet! I have been on the phone with my mom, sister, and neighbors, telling them I FINALLY made my 1st batch of good cookies!! THANK YOU for the recipe, and all the helpful tips! I think I have been over mixing my whole life! I feel like I do a decent job cooking, with the exception of cookies—until now! THANKS!! big thank you for this recipe! My husband L-O-V-E-S chocolate chip cookies and I have failed so many times, and swore I would never try again. My sister showed me this recipe and I thought what the heck. I will never forget my hubbys face when he bit into one of your cookies and said "they're actually good!" ???? Hello! I’m currently making these cookies now. I’ve been very conscientious to not over mix. I’m noticing there are still chunks of butter in the dough that aren’t full mixed in. Is that how it should be? I’m trying this recipe for the first time and I’m confused about the convection instructions. When I enter a convection temperature into my oven, it automatically adjusts the temperature down by about 25 degrees. So, when I bake these cookies on convection, should I use my ovens adjusted temp, 350 degrees, or should I type in 400 so it bakes at convection adjusted temp for 375? I was excited to make these. They turned out very flat and greasy not sure why, as I followed all the directions??? I’d love to know how much flour you use by weight. I’ve made this recipe a couple of times and had some successes and some failures. I think it depends on how I measure my flour. How many ounces do you use? Holy Chocolate Chip Cookie Perfection!!! Thanks for sharing! I think I’ve been over-mixing my butter/sugar my whole life. These are life-changing! Chocolate Chip cookies are one of our family love languages! THANKS!!!!! I’m a bit embarrassed to say but we have made your cookies a hand full o times over the last few weeks and are starting another batch right now. They seem to disappear before They even have time to cool and are the most requested treat from my little guy. I have never found a recipe that gives me consistent results until this one and absolutely love all of your tips! I was wondering in the ingredients amounts, do you prefer to use one teaspoon of kosher salt? Yes, I use one teaspoon of coarse Kosher or Sea Salt. Hope you love this recipe as much as we do! I am going to try these. They look great! I was wondering if you could explain why you say don’t sift the flour? Kristina, Sifting the flour makes it lighter, and the consistency of the all purpose flour is perfect in this recipe. I never sift flour for my cookie recipes! This recipe does have a cup of cake flour which is very light and works well with the all purpose flour. I think you’ll love this recipe! I was reading the comments for extra tips, and I see here that you mention cake flour, but I do not see that listed in the ingredients above. Am I missing it? This recipe does not include cake flour, maybe you are confusing this with the Levain Bakery CC Cookie recipe? All purpose flour in the Tried and True recipe! Give this a try, I know you’ll love it! Just taking the last batch out of the oven. I have tried a lot of chocolate chip cookie recipes and this is a great one! A definite keeper for my recipe collection. I followed your suggestions and they were great. Thanks! Maria, Thanks so much! Im glad you loved this recipe 🙂 Happy baking and thanks for reading ABK! Fourth time making these! These are just the BEST! Any advice if I don’t have a kitchen aid mixer and just have a hand mixer? Hi Rachel, Years ago, we used to make cookies without a mixer. You can cream the butter and sugar together until smooth, you may need to soften the butter a bit more or beat a while longer than the directions state, since you are using a hand mixer. No worries. Just keep the beater speed at medium, you don’t want to beat in a lot of air. When you have the butter and sugars creamed, add the eggs and mix until smooth, just a few seconds. Then just remove the beater and add all of the dry ingredients, including chocolate chips and fold in. If the dough seems sticky, fold in a tablespoon or two of flour. Love nuts in my chocolate chip cookies. Any guess on an amount to use that doesn’t mess up the recipe? I believe you can add one cup of chopped nuts to this recipe and reduce the flour to 2 1/2 cups. If the dough seems sticky, fold in another 2-3 tablespoons of flour. Trying these out today for a volunteer event :). Found your site when looking at the New York Times cookie and decided on these instead :). Thank you for the cookie class!!! I’m so glad you read my Notes- once you learn a few tips, these cookies will never disappoint! I just made a batch myself last night. Let me know how the volunteers liked them. These were delicious! I really found your tips helpful and I followed them all. I have such a hard time finding “THE BEST CHOCOLATE CHIP COOKIE” because everyone’s opinion on the best is different, and frankly I don’t care for many of them. This is officially printed and going in my keepers cookbook. Hi! I have become a loyal follower of Bountiful Kitchen and whenever I am searching for a recipe I Always check your blog first to see if you have the recipe and if you do I look no further! I love baking and have come to have somewhat of a reputation for the treats I bake (just amoungst the small circle of people I pawn my goods onto). When I first got married and got my first kitchen aid I would bake cc cookies and my husband loved them and his love for them kind of ignited my love for baking. I have the toll house recipe memorized and can make a batch super fast but over the years I always find myself wondering if they will turn out.. i just tried this recipe as my frustration with my cc cookie results had me defeated and I just have to let you know this recipe is a game changer! Life changer (dramatic I know but of all the things I bake my husband just likes the classic chocolate chip cookie best) and like an epiphany (duh, I try every other recipe why would I have waited so long to try a recipe for a cookie that is like the foundation of my baking!). This recipe is just what it says- Tried and True! My go-to for chocolate chip cookie lovers and such a delicious treat. I’m glad your husband gave it his approval. Now just memorize this recipe and you’re good to go! Thank you for being such a loyal follower! I made these today and the first batch, i add an extra tablespoon of flour and it went flat. I had to add at least maybe a 1/3 or 1/2 of a cup. I feel like i did everything right except maybe over mixing? What do you recommend? Would over mixing cause it to be flat? I wonder if your butter was too soft? That’s a common problem. Did you refrigerate your dough before baking? I’m sorry it didn’t produce the results you were looking for. The less you mix this dough, the better. I’m looking to make a Chocolate Chip cookie “cake” – a cookie that is baked like a bar cookie but in a round or heart shape cake pan with the same yummy texture as a chewy choc chip cookie. Have you tried something like that with this recipe? Yes, You can use this recipe as a pan cookie or in the shape of a heart. The cookie should take about 17 minutes to cook, but all ovens are different, just keep an eye on it and remove from the oven when the top turns golden brown. Any way you cook these, they are delicious! Send me a picture of your creation; I’d love to see. I just made these and used my ovens convection setting. They look exactly like your picture. I don’t think that’s ever happened to me before! Can’t wait to try them and see if my husband likes them too. I’m so glad this recipe turned out well for you! I hope this becomes your “Tried and True” go-to recipe for chocolate chip cookies. Let me know how you like them. I just THOUGHT I already had a favorite chocolate chip cookie recipe…and then THESE happened! I followed the recipe and all your tips then added just a smidge of coarse sea salt to the tops just before baking…not much…just about 6-10 “bits” per cookie…OHMAGOODNESS!! Yummm!! Just crispy enough on the outside and chewy on the inside…perfection. Thank you for your approval. I love this recipe! Sweet and salty = YUM. Thanks for letting me know how much you like these cookies. Living in the same elevation as you I’m so glad I found you recipe! I hate how my chocolate chip cookies never turn out and fall flat and I’ve tried a million different recipes. Yours works EVERY time! Thank you!! Also can I just say I love your notes at the end of your recipes!! I found that I was mixing my dough too much which was also not helping and you have it down to the second…. LOVE!! Thank you Marisa! I think the method is EVERYTHING when baking. Sometimes the same ingredients mixed differently will result in a completely different end product. Thanks so much for reading ABK! I have tried many chocolate chip cookie recipes and this is BY FAR my favorite!! I followed the recipe exactly (I am at the same altitude) and they couldn’t have been better! Only problem-my daughter’s friends came and ate the entire plate-oh well, time to make more! Si! I’m not sure what I did wrong. I’m wondering if it could be my oven. 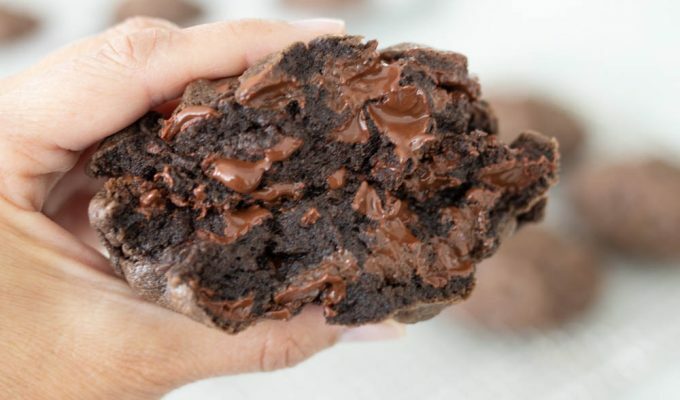 I loved the taste of the dough and I followed the little mixing details of the instructions and it just doesn’t seem to be making me that perfect chocolate chip cookie. Some of my cookies turned out really flat while a couple on the sheet looked pretty decent. I’m in charge of bribing cookies for the teamsters tomorrow for teacher appreciation and I’m so bummed this recipe didn’t turn out for me. Any tips or pointers? I have a tried and true recipe that starts with the Nestle recipe, but I use butter flavored crisco instead of butter (adding a T of water), add a package of vanilla pudding mix to butter/sugar mixture, and use more salt than the recipe calls for. Oh and I swear by Ghiradelli semi-sweet chips. The cookies turn out perfectly soft and delicious every time! The crisco keeps the cookies from flattening out. Thanks for your recipe! I’m sure your cookies are delicious. Ghiradelli makes fantastic chips. Thank you for reading ABK! I love a good giant chocolate chip cookie! But when I have all these littles in the house, a giant cookie isn’t always the best. Any suggestion on the cooking time if I made them smaller? Say a TBSP of dough…? These cookies will taste amazing no matter what size you make them. The best way to determine bake time for a smaller cookie in your oven is to do a test batch and keep an eye on them. Time the cookies. As they bake, the dough will turn shiny. When the dough starts to brown and the shine is gone, take them out. Once you have timed one batch, you’ll know how long to cook the rest. Read my tips and tricks for this recipe and you won’t be disappointed. Your littles will love this cookie! Just finished making the dough and it is delicious! Thank you!! I’m wondering if you have you ever frozen the dough? Would you just add a min or two to the cook time? Hannah, yes I freeze the dough all the time! You can take them straight out of the freezer and cook them, or let them un-thaw for about 15 minutes. I always form the dough ball first though. It may take a few minutes extra to bake. I would just watch them closely until the top of the cookie sets and the dough looks like it has a bit of a crust. I’m a missionary in the San Diego California Mission and I made some of these cookies for my district. They were so good!!! So good to hear from you! Love that you made these for your district. Hope all is well in the San Diego mission! Just made these for the first time with my 5 year old daughter! Questions… can the dough be placed in the freezer or refrigerator? Looking to bake the rest in about 3 days, do you think it will be okay in the refrigerator in a air tight container? Hope you are having a blast with baby Millie! Yea, I often make these ahead and refrigerate or freeze. They will be fine in the fridge for up to about 5 days if sealed tightly! I use a ziplock bag to insure the cookies don’t get dried out, or place on a cookie sheet and wrap tightly with plastic wrap. Thanks for reading ABK! I made these dairy free by replacing butter with shortening. I used crisco butter flavored (that’s what I had in my pantry). I also used Enjoy Life dark chocolate chips. I am all used a bath I of vegan by also replacing eggs with Follow Your Heart Vegan Eggs. These are my go to egg replacer, you can even scramble them. Thanks again Si for a great recipe. I was so excited to try this recipe. I had a recipe that I really loved but decided to branch out and see if I could find one that was better. I made this recipe exactly to the directions but the dough was very very sticky so I ended up adding almost 4 tablespoons of flour and even then it was still sticky. The cookies didn’t seem to have enough chocolate chips, and they seemed much more cake-like vs cookie like. I don’t think I will make this recipe again. Hi Brooke, I’m sorry to hear that these didn’t turn out well for you. Sometimes the dough gets sticky and doesn’t have the right texture if you over-mix it. How much flour did you use in total? I have to admit I was skeptical about making these since it was mostly the recipe from the toll house bag of chips. So glad this one proved me wrong! We LOVED them. I followed exactly and turned out great. Which has been very trying moving to high altitude from sea level! Thanks. These are by far our favorite CC cookies and I am so grateful for your tips on mixing and baking… key elements in a successful batch! How would you recommend adjusting the recipe if I wanted to add coconut flakes as well as chocolate chips? You’re very welcome, Michele. Since the recipe calls for 2 cups of chocolate chips, I would use 1/2-1 cup of coconut flakes and 1 cup of chocolate chips instead. Hope this helps and thanks for asking! Hi Elizabeth, thank you for your comment! I love how easy these cookies are and they’re perfect for anyone to make. I’ve made delicious cookies since I was 12, over 40 years, but this recipe has become my very most favorite, and I bake them a LOT! I love the why’s you share, so great to learn more about baking. I love your site:). Thank you, Venita, that’s such a big part of why I love cooking. Sharing yummy food and making great memories! Can this dough be made ahead of time and kept refrigerated? If so, how long? Yes, you can name this ahead, I have many times. I usually prepare the dough and then scoop the dough into balls and refrigerate or freeze until ready to bake. If refrigerated, it keeps wrapped tightly for up to a week. If freezing, the dough will be fine for a month. My new go to recipe!! My cookies have been flat and gross looking the past few times I’ve made them and it was so frustrating! Came across your recipe and they worked perfectly. Thank you!! Thanks so much Alexis! Glad you loved this recipe and thanks for reading ABK! Ok, so I have ALWAYS struggled making chocolate chips cookies. They turn our flat and blah but I came across this recipe somewhere on Instagram and tried it. It’s AMAZING because they turned out wonderful and delicious. I was so proud of myself that I make these at least once a month and freeze them. I love your idea of combining milk and dark chocolate, that sounds delicious! This recipe is definitely a staple in our home now, and perfect for freezing for later. Thanks for sharing, Amy. I tried this recipe today for the first time and it is the best chocolate chip cookie I’ve ever made. I followed the recipe to the “t” and they turned out perfect, I loved the sea salt in them. I’m so glad you enjoyed them, Holly. I think the sea salt really adds to the flavor. Thanks for sharing and for reading ABK! I’m dying to make these like right now but I don’t have unsalted butter. Just the salted from costco. Will that work or do I need to change the salt in the recipe? Hi Tammy, the salted butter should work just fine. I just prefer using unsalted butter. Thanks for asking! Hi Si! You don’t know me, but you’re a household name in our family! 🙂 We try a new cookie every week, but these really are our “tried and true”! I was reading through the comments and I see that you can freeze or refrigerate the dough in advance…have you ever frozen these cookies once they are baked? Thanks! Thank you for being such a loyal reader, Katie! It’s hard to beat these cc cookies. They’ve been a favorite of ours for years. And yes, you can freeze the cookies once they’re baked, I do it all of the time! Usually, when I know Im going to freeze the cookies after baking I under bake just to make sure the cookies stay soft and fresh tasting! Bake just until the top of the cookie is set. I used to be discouraged because my chocolate chip cookies would never turn out good until I found this tried and true recipe. This recipe is hands down the BEST chocolate chip cookie recipe I’ve ever tried. I’m so excited! The cookies come out perfectly every time. They are so delicious! I’ve been making chocolate chip cookies for a long time (40 years)and could never understand why they would turn out flat!! I will never make another recipe!! They are fantastic. I made them gluten free, no one could believe that they were gf. Thank you!! Thanks so much for sharing. Success really is in the method with this recipe! And love that you had success using gf flour as well. Thanks Nicole! I often make them in the smaller size as well. When I make them smaller, I usually refrigerate the dough while, it seem like they hold their shape better. I appreciate your feedback! I’ve made these cookies at least 10 times in the past two months. These are the best chocolate chip cookies I’ve ever had, perfect recipe. My neighbor always begs me to make these for barbecues, birthdays, you name it! I made these for my husband and he took some to work and I had to make another batch!! So GOOD. These are by far the most perfect cc cookies I’ve ever made. And my family agrees! I followed every tip and they were absolutely delicious. You have to make them on the bigger side and only put six to a cookies sheet (as recommended). It’s so worth it! I’m glad you enjoyed them as much as we have, Jamie. They’re such a great treat to make for the whole family. Thanks for sharing and for reading ABK! ABK’s tried and true chocolate chip cookies are our family’s go-to chocolate chip cookie recipe. I love that my kids make them. My nine year old daughter doesn’t even need to look at the recipe anymore. 🙂 We’ve made them bite-sized (reducing cook time) and very very large. The only recipe alteration we’ve tried is usually we like to do 1c milk chocolate and 1c semi-sweet chips. But we’ve tried all sorts of combinations with the chips as well. The only problem we’ve ever had with these is when we’ve accidentally overcooked them. Take them out when they start to shine. 🙂 These are the best!!! Somewhere in the last twenty years I lost my touch for chocolate chip cookies and gave up because they always turned out flat, no matter the recipe. I was so discouraged… until I found your recipe and detailed instructions. THANK YOU! The recipe is great and the instructions are invaluable! The family is also super happy with the results!